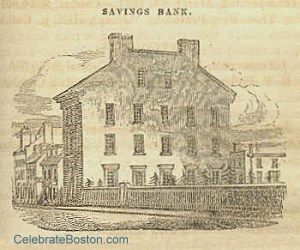 The Provident Institution for Savings was incorporated on December 13th 1816. It was the first mutual savings bank to be incorporated in the United States (the Philadelphia Savings Fund Association opened about the same time). A mutual savings bank is owned by its depositors. Each depositor has a proprietary interest in the retained undivided profits of the institution. In England, a few mutual savings banks existed before 1816, and the goal of these entities was to improve the community. The following is quoted from the bank's first annual report of 1817, which conveys the institution's original mission: "The Members of [the] Corporation, who were animated at its first establishment, to direct their exertions to benefit the middle and poorer classes of Citizens, both in their morals and their property, must be gratified with a detailed statement of such facts [significant deposits in 1817, with low expenses], as have occurred in its operations, as it is presumed this may satisfy them that those commendable designs have been crowned with success." The December 17, 1816 of The Recorder newspaper, describes how Provident planned to operate: "The object of a Savings Bank or Provident Institution, is simply to provide a place where the poor may deposit their small savings, and be allowed to receive interest, with liberty also to withdraw the whole or any part of their deposit whenever they may desire it. Such institutions have been recently established in Great Britain, and especially in Scotland, with the happiest effect. Within a few weeks they have been introduced into this [country], and will soon be in operation in New York, Philadelphia, and Boston. These institutions are now managed in the most simple manner, and at an expense absolutely magnificent. The following abstract of the Constitution of the Savings Bank of New York contains all the essential parts of the [Provident] plan. Deposits of one dollar, or any number of dollars, shall be received, but no fraction of a dollar. An interest of five percent per annum shall be allowed on all sums deposited in the Bank, from five dollars below fifty dollars, and on all larger [sums]; but no interest shall be paid for on any sum for any fraction of any calendar month. All monies deposited in the Bank, except such sums as it may be deemed necessary to reserve for immediate purposes, shall be invested in Government securities of the Unites States, or other funds. The deposits shall, be entered in a book at the time they are made, and the depositor shall receive a book with a similar entry therein, which must be brought to the bank every time any further sum is deposited. A draft or check, signed by any depositor for the whole or any part of his or her deposits, shall be paid when presented at the bank, if it be accompanied by the book of such depositor, so that the payment of such draft may be entered therein. The accounts of the Bank to be made up at the end of every year. The Constitution also provides for the appointment of Directors who are to meet monthly, and examine the accounts of the Bank. They are to appoint three of their own number to attend at the Bank during the time it shall be open, and to have the general management and superintendence of it during the recess of the Board. Such is the Institution is denominated a Savings Bank or Provident Institution. Its advantages are obvious. It presents a motive sufficiently powerful to indure the poor to preserve all sums for which they have no immediate use. In the Savings Bank, these little sums instead of being wasted, or worse than wasted in supporting habits of intemperance, will be safely preserved, allowed to accumulate, and after a course of years will frequently furnish a competent support of old age." 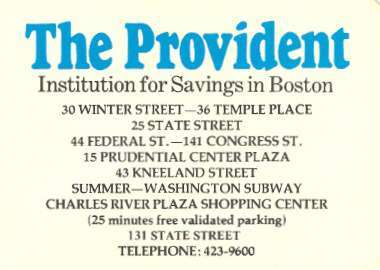 The Provident Institution for Savings operated until 1986. The bank had converted from a mutually owned entity to a publicly owned savings bank, and was quickly bought out by Shawmut National Corporation.